There are things that we just meant to be together. Peanut butter and jelly. Green mangoes and bagoong. Mayonnaise and…(pretty much) everything. Add to that list, Robyn Eckhardt and David Hagerman. Through their food blog, Eating Asia, these partners in life, food and travel have beautifully documented their adventure in and around Southeast Asia. Introducing the blogsphere to the diverse cultural and culinary delights this part of world has to offer, this globetrotting duo have elevated food blogging into an appetite-whetting art. Hello, Robyn and David. Tell us a little about yourselves. We were both born and raised in Michigan (American Midwest). Our ‘life in Asia’ started with a year teaching English in China in the mid-eighties. In 1994 Dave moved to Hong Kong for work, Robyn followed soon after, and then we ended up back in China till 1998. After three years back in California, Dave accepted a job in Bangkok and we haven’t looked back. Right now we feel Southeast Asia is where we belong. After a year in Bangkok, we spent 2.5 years in Saigon, before moving to Malaysia in mid-2005. How and when did you decide to make food/travel your life’s work? Dave has been photographing for years and years, and I (Robyn) have been writing –albeit in a different, academic, capacity–for almost as long. We’ve always been into food and travel and have particularly admired Saveur magazine and it’s approach to ‘real’ food. When we moved to Malaysia, we started the blog–it was sort of our ‘guinea pig’ to see if we could work together to write about and photograph food. That’s how it started, really, with the blog, though we’d been thinking about it for at least a couple years prior. Robyn, many regional cuisines like Thai, Singaporean and Vietnamese have found their place on the world culinary stage, why do you think Filipino food hasn’t achieved the same global acknowledgment? Well, to begin with, there are not that many Filipino restaurants overseas, so knowledge is slim. Second, Philippine street food is, to tell the truth, not particularly appealing. Visitors to Thailand, Singapore, and Vietnam are immediately assaulted with all kinds of hawker foods that are very accessible, and very appealing, and they are right on the street–or in a food court that’s easy to find. The visitor to, say, Manila, won’t have that sort of experience, unless they happen to stumble upon Salcedo. Which brings us to promotion–the Philippine tourism authorities do not attempt to promote the PHI as a tourism destination. They could learn from Singapore’s tourism authorities, who have succeeded in pushing an image of Singapore as the best place for food in Southeast Asia by educating the foreign public via events like Singapore Food Festivals staged in cities all over the world. Finally, until recently I think the very best PHI food has been found only in private homes. I notice that in the last few years in Manila, at least, there are more and more eateries where visitors can find excellent versions of PHI homestyle dishes. Filipinos are very picky–a Kapampangan, for instance, would probably turn his nose up at Abe. But for me, a visitor, it’s quite good–and it flouts preconceptions that I may have had about Filipino food. The challenge is getting people to even consider a foodie trip to Manila in the first place. I hope we made some headway there, with our WSJA article. Robyn, do you ever get tired of writing about food? You’re kidding, right? Do you? I recently wrote a feature story that had nothing at all to do with food. It was the hardest thing I’ve ever written. Food is my thing. David, you take some most outstanding photos we’ve seen. Can you describe your process for us? What is involved in taking the perfect photograph? It’s important to have your wife nagging you to take the perfect photograph. Some advice: watch your light, fill the frame with your subject, and look for something you haven’t seen before in photographs of the subject. David, do you shoot anything else aside from the subjects that you pursue professionally? Sure, the camera is with me all the time. I shoot our pets. We have three dogs and four cats. Seriously, I’ve been experimenting a lot lately with the use of light and capturing motion. A kitten is a great subject. You have been writing, shooting and living in Asia for a while now, what changes have you observed in the regional food scene? We’ve seen markets disappear, or be tidied up. We’ve seen street food disappear (our reference here is Shanghai, where we lived for 2.5 years). We’ve seen increasing sophistication in terms of Western foods in some places, like Singapore, Manila, Bangkok, and, slowly, Kuala Lumpur. But we’re also happy to report that so many traditional foods and food production processes remain. That makes us happy, because we’re really not interested in reporting on topics like Asia’s Michelin-starred restaurants (and there are already enough people who do that sort of food photography/writing anyway). Blog: Viet World Ktichen. Andrea Nguyen is a great writer and the blog is an intriguing combo of recipes, newsy tidbits, ingredient discussion, links, etc. We love Vietnamese food but strangely it is one Asian cuisine Robyn doesn’t cook much. So we get our fill here. Cookbook: Pick just one? Robyn cooks many cuisines so that’s hard. At the moment, Dunlop’s Land of Plenty (Sichuan food – our first experience of Asia was in Sichuan), Besa’s Memories of the Philippine Kitchen (as much for the writing and photography as for the recipes), Lynne Rosetto Kaspar’s The Italian Country Kitchen (fantastic, TRULY fantastic and authentic Italian cookbook), and Alford/Duguid’s Mangoes and Curry Leaves (every single recipe works like a charm). Food-related TV show: On National Geographic, “Food Lover’s Guide to the Planet.” It’s informative and entertaining and doesn’t talk down to the viewer. It’s the sort of show that we’d love to do research for. Food magazine: Some months it’s Saveur, other months it’s Gourmet. Depends on how ‘out there’ they’ve gotten with their food-travel topics. Say I am visitor from out of town who visiting Kuala Lumpur for the day, where would you take me for breakfast, lunch, an afternoon snack, dinner and later night supper? Breakfast: Imbi Market, downtown. An amazing selection of street foods, mostly Chinese, all delicious. Lunch: Ikan Bakar Pak Din, in the Lake Gardens. Grilled fish and delicious Malay dishes. If Pak Din’s wife has made her incredible chicken rendang you’re in real luck. Closed Sunday, lunch only. Afternoon snack: Chat Masala on Jalan Tun Sambanthan in Brickfields. Indian chat (bite-sized snacks) served only after 4p. The puri and fruit salad are highly recommended. Dinner: Sek Yuen, a 50+-year-old Chinese Malaysian restaurant where the entire kitchen is still fired by wood. They don’t make places like this anymore. The food is ethereal–rice is not boiled but steamed in individual metal bowls. Go for the stuffed pig’s trotter; red-cooked beef, beef stomach, and tendon; sweet and sour fish; roast duck; stir-fried baby gailan; ‘shark’s fin’ (it’s not really) stir-fried with egg and served with iceberg lettuce cups and black vinegar. Late night snack: Tengkat Tong Shin, a street parallel to the famous Jalan Alor–on the same side of the street as Max! Kitchen (a very good restaurant, by the way) an old guy stir-fries noodles in an alley. His mee sua is wonderful–charred and smoky. Snyder’s pretzels. And chicharon which, thankfully, we can’t get too often in Malaysia. Bony freshwater fish. Too much work. Can you give three tips for would be food writers/bloggers/photographers? Food writers Don’t go into it for the money (there’s very little), be a writer editors love to work with, and lose your ego. Editing for publication can be brutal. Food bloggers Write what you know, find a niche, and do it because you love it. That said, some bloggers have systematically marketed themselves to earn money from it and have done well. But we just couldn’t be bothered if it wasn’t something we enjoyed. Photographers (from Dave) Love what you are shooting, get people involved in the photograph, and don’t get hung up on equipment. 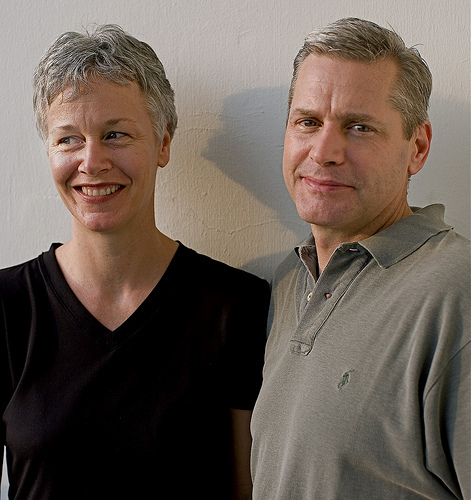 What are the future plans for Robyn Eckhardt, David Hagerman and Eating Asia? We’re working on a book proposal, but we’ll leave it at that for the moment. It won’t be EatingAsia in book form. Thank you to Robyn for providing the photo. Thanks for the interview, and that really sweet intro. Apparently I didn't proofread my answers - I meant to say that it is a shame the PHI Tourism Burea doesn't attempt to promote PHI as a FOOD destination, which is an opportunity lost. Thanks for the interview and the kind words! Keep up the good work! Hi Robyn.You're welcome. :) The pleasure was really all mine. I'm a fan. Hi Dave. I should be thanking you. :)I truly hope you and your wife continue to do what you do. You both do it so well. Very fun! I love that blog and really enjoy learning more about Robyn and DAvid. Great interview, I followed the Link from Robyn and David's blog. A nice insight. Thanks for the interview. Eating Asia always makes me homesick. I actually wholeheartedly agree with Robyn's comments of Filipino street food. Go to Thailand and you will actually want to eat their food. Here, the food just isn't presented as well. Hi stich. I agree. But I think there is just no motivation of eateries to want to improve.